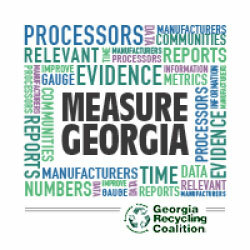 Some of the nation’s largest users of recovered materials call Georgia home, employing thousands of people in the state. We have mapped the recycling industry and will soon have the data to make some statements about the size and economic impact of recycling in Georgia, but we have no metrics to gauge our success based on tons recycled. While we acknowledge that all metrics are imperfect, that we will need to use several approaches, and that some things may have to change over time, now is the time to work together to begin collecting data toward measuring so that we can check our progress and improve programs in areas that need a boost. will need to use several approaches, and that some things may have to change over time, now is the time to work together to begin collecting data toward measuring so that we can check our progress and improve programs in areas that need a boost. will need to use several approaches, and that some things may have to change over time, now is the time to work together to begin collecting data toward measuring so that we can check our progress and improve programs in areas that need a boost. Check out this Dec. 2017 Webinar on YouTube for Information on the new and improved Re-TRAC Connect Measure Georgia system.